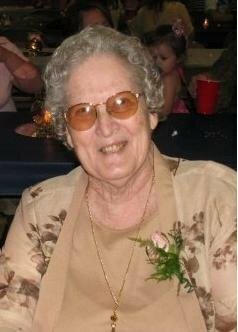 Ludia Ella McCutcheon (everyone called her “Nana”), 82, went home to Jesus on Friday, June 29, 2018 with her family by her side. She was born in Wichita Falls, Texas on August 26,1935 to Lonnie Herbert and Myrtle Ophelia Jeter Durrett. She graduated from Whitharral High School in 1953, and worked for an accountant before street racing against her future U.S. Air Force husband in Lubbock, Texas. As the story goes she won that race. She married William Andrew McCutcheon on October 30, 1954. After Bill and Lou were married they traveled from base to base as a military family settling in Marietta and finally Vincent, Ohio. Ludia valued family above all worldly things and enjoyed every minute with her precious grandchildren. She demonstrated her love countless times while caring for military family during deployments, including riding out South Carolina hurricane Hugo. She loved her new Faith Baptist Church family who lovingly adopted her as “Nana” or Grandma Lou. In recent years Facebook and Facetime kept her in touch with her grandchildren who are stationed around the world. She was a home maker who enjoyed knitting, crocheting and sewing. Ludia was preceded in death by her husband William Andrew McCutcheon; infant granddaughter, Kelly Ann Thomas; brother, Lonnie Durrett; sisters, Wanda Fincannon and Mary Blair; and son-in-law, Earl Treadway, Jr.
She is survived by her six children James (fiancé Charlotte) McCutcheon of Vincent, Ohio; Sandra Thomas of Apopka, Florida; Richard (Kelly) McCutcheon of Fleming, Ohio; Brenda(Jerry) Muntz of Lake Orion, Michigan; Randell (Anita) McCutcheon of Vincent, Ohio; Sherri (Jon) Penko of Mount Vernon, Ohio. She loved all 17 grandchildren, Steven and Michael McCutcheon; Michael, Terry and Andrew Thomas, Amber Butler; Amanda Gill, Stacy McCutcheon; Matthew and Bradley Treadway, Katherine McCrady; Jill Shutts, Adam McCutcheon, Kaitlin Adams; and Tyler, Tanner and Timothy Penko. She enjoyed every minute with her 28 great grandchildren and many precious nieces and nephews. Visitation will be Thursday July 5, 6-8pm and Friday July 6th 1-2pm at the Barlow Chapel of Cawley & Peoples Funeral Homes, 8365 St. Rt. 339, Vincent, where funeral services will be held at 2:00pm Friday. Burial to follow at the Bartlett Cemetery. There will be a Celebration of Life service on Sunday, July 15th at 2pm at Faith Baptist Church, 8764 Martinsburg Road, Mount Vernon, Oh 43050. To send flowers to the family of Ludia E. McCutcheon (Durrett), please visit our Heartfelt Sympathies Store.